Camping and playing this weekend with the family. Thought we would try for some of those Tablerock walleye. Pics of myself, my brother, and my future daughter in law. Went down yesterday with Buzz on the Elk and we did a little fishing. Fishing was on FIRE! Last two times I have been out no matter where I have been the fishing hasn't been that great, but boy howdy that all changed yesterday morning. We no longer than got into the water and Buzz had the first one on of the day. Like his first or second cast and a nice smallie came to hand. My first one came a couple minutes later and it was a nice chunky 15" smallie. I think we were no longer out than 50 yards from where we launched and we caught over a dozen smallies in the first 30 minutes! We stayed for a couple of hours and then the bite just shut down. We hit a stretch that we didn't even cover maybe a mile? All in all within 2 hours we had caught over 30 smallies between us and only one dink that was under 12". For the most part half of the smallies we caught were in the 15" range. Buzz ended up with the biggest one at 17" and my biggest was 16". It was just one of those days were everything went just as planned and the fish were feeding like crazy on topwater. Caught pretty much the majority of fish on the Whopper. It was a busy day at our house as well. I wanted a ham, bacon and cheese sandwich. So I went out and butchered the pig this morning, went ahead and begun the cure on the ham and got the pork belly smoked with Applewood smoke. As the ham was curing, I went ahead and grew the wheat and milled it for the bread. I had an old Italian bread recipe from Maiers. Once the bread was in the oven, the tomatoes were just about ripened. I picked one of the ripe ones and sliced it. I sliced the bacon and ham and cooked them both. Just as the meat was cooking, the Colby jack cheese was getting done. I took a couple of slices for the sandwich. A quick mayonnaise was prepped. Toasted the bread, added the mayo, laid on the tomatoes, Salt AND pepper on the tomatoes, then the cooked bacon, Colby jack cheese, and topped with the cooked ham. Not a bad day of work ! Or I just bought the stuff and made a sandwich! Got the itch for green chili, so got some Anaheim chili’s, tomatillos and pork. Scorched the chili’s and tomatillos under the broiler, then blended together, Browned the chops, then some onion. Chili mixture, diced pork, chicken stock, cumin and garlic and braised for a couple hours. Burrito last night, over eggs this morning. Dang (I still dang myself). Speaking of agents, wrench will like this one. Sarturday while floating, I got a text from our local agent. Now mind you, he has never seen my vehicle. But at some point since I got it, he saw it at some access and must have ran the tags. So he was out and about checking accesses Saturday. Proof positive that 1, they do see you and you don't see them. 2, they do work weekends too. I'm one of the captains on the Belle so maybe I can answer a few questions without getting myself in trouble. Fortunataly, I wasnt there when it happened but was called in afterwards. 1)The ducks are inspected by the coast guard annually just like the Belle. We are regulated by subchapter K in the CFR so we are a "k boat" and to my understanding the ducks kind of have their own checklist because they dont necessary fit into any of the existing subchapters. 2)They do monitor channel 13 while they are underway but I think they probably only turn that on to make a call right before they splash in the water. Occasionally they call asking for wind readings but that's not a routine thing. 3)Both of the ramps they use are in the SBB parking lot. They enter South of the Belle and exit North. There was actually 3 ducks on the water the other night(1 black and 2 white). The black one made it to the ramp first so it wasnt in any of the videos. 4) Bill was correct about the NW wind on that part of the lake. It is a beast and they had no business being out there. I've docked the Belle in 56 mph NW and it was interesting to say the very least. It was 15-20mph stronger the other night so I know it had to be brutal. Why didn't they look at a radar? I've got a ky3 weather app on my phone that takes less than a minutes to pull out and check. They knew it was bad shortly after they splashed in because all of them went between the Belle and the island instead of around the west side of it like they normally would. Why didn't they just turn around and go back to the south ramp? Once they got tucked inside the point south of the Belle I can't help but think it would've blocked atleast 40-50%of the wind and they could've made it back fine. I'm not in that cove much but I'm pretty sure the lake isn't as deep there either?? I'm sure you guys have all been playing the same scenarios over in your heads. Its definitely a terrible situation for everyone involved and my heart breaks for the families. I've gotta give a shout out to my Showboat people though because they all stepped up and did what needed to be done. A lot of them risked their own lives to help people they didn't even know! Everyone should get The MyRadar app. Loads instantly and even has an alert feature. It’s the fastest way to get to radar without waiting for a bunch of advertisements to load. Even all my kids have it. Proud daddy here. Co-angler #2. This is the jig I caught the Brown with. 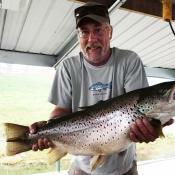 Ham that is a great brown trout! Congrats on a great day! Sure looks like creek chubs to me as well. The garden has done well. I just took inventory. So far I've put up 36 pints of pickles of various description, 20 pints of salsa and 10 quarts of plain canned tomatoes. There are 5 gallon bags of corn on the cob in the freezer. And it all just keeps coming. Two more big rows of corn that is tasseling now, spaghetti squash everywhere and no shortage of green beans. The tomato avalanche is in full swing. Any kind of small point in a pocket seems to hold fish right now. It's weird too, if you try one pocket and don't get bit, go on to the next one and they'll be in there. They're spitting up crawdad claws and really chasing small bluegills. I'd say that a gill colored squarebill or shallow scatter rap would work too. I almost tried that yesterday. You wouldn't believe me without seeing it. I start on main lake points and have been catching them both deep (20-25ft) and shallow enough in the pockets that you can see some of them. They're relating to rock and bushes like crazy early in the mornings still. I can't make myself not flip a bush or a stickup in the water. Every crankbait fish is on a point though. Dwayne beat me to it. Me and Gary Flipping watched a gang of browns coral a bunch of stockers against the bank on the White one time. They would take turns charging into the rainbows and eating them. Some of the rainbows jumped out of the water onto the bank to escape the marauders. Just drove through Wisconsin, Minnesota & Iowa. The Upper Mississippi & Yellow are at flood stage so is the Wapsipinicon, The Upper Iowa near Decorah looked fine, so did the Zumbro, and the Namekagon & St. Croix looked good. The Cedar River near Cedar Falls looked really good but its big water. About the size of the Meramec near St. Louis. Did not fish for Smallmouth in Iowa but caught a couple wild brown trout on a creek near Decorah, caught some pike, smallmouth, and walleye on the Chippewa near Hayward. That sounds like a plan!. That’s funny because that is kind of how this whole adventure began. I started coating some lures with a fingernail polish and was getting good results fishing that lure. I wanted a smoother, more even coat, so I got the airbrush. Fingernail polish was horrible to clean out of the airbrush, so I started looking for a water based substitute and found the powdered mica pigments. Started having fun with that but did not want to purchase any more $25 lures, so I found the $2 blanks that looked similar. Now I’m just trying to narrow it down to the ones that will fish and suspend similar to the original lure I coated with fingernail polish. Definitely no detail involved in these guys. Great fish and story. Congrats We left shortly after you came by. Striper fishing is a Norfolk thing. A few are up by the Power Site Dam. i don’t fish the lake during tourist season. I would guess drop spotting on bluffs and fishing brush piles any and everywhere. Enjoy your stay! You can also just use sharpies. 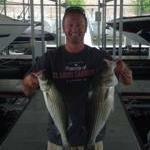 I won a tournament in Pomme de Terre one time on hand painted crankbaits. Caught some fish prefishing in a certain color and couldn’t find any others that color. So we headed to Walmart in Bolivar and bought some nail polish and painted them that night in the room. But a airbrush is so much easier to use. Great job Dan! Congrats on getting those 'Rock 'eyes! Looks like you guys had a great time. Thats a fish worth catching! darn tasty as well. Called the poor man's lobster. Ness can keep his Dangs I would like to get some more! The way my boat trips have gone I may not catch a marine sculpin big enough to eat. Though it's still on the "to do" list😁! Sweet great report. The mother that lost her husband and children along with the grandparents was heart breaking on national news. This may be the end of the ducks and it is for sure going to cost someone bushels and bushels of money. Here are some of the tips that I have so far to help flatten out the learning curve with airbrushing lures and applying 2 part epoxy. Use high performance reducer to thin water based acrylic paints to the consistency of 2 % milk. Apply coats in light layers and heat set with hair dryer to speed up drying process. Mix powdered mica pigments with a balancing clear and reduce with high performance reducer. Powdered pigments are much more effective over a dark base layer than a light colored base. Use many more light coats of powdered pigments when covering light colored base and heat set with hair dryer between coats. Keep air brush clean! Use a windex/water mixture for cleaning. A rotating fly tying vise makes a great lure holder for painting. Blue painters tape masks off bait bills and eyes and is easy to remove once bait is dry. PearlEx interference blue is really cool stuff! 2 part slow cure epoxy is really thick and starts to set way faster that I would like. Slow the process down by mixing on a paper plate covered with aluminum foil. Add 5 drops of denatured alcohol to mixture to help thin a bit and add again if mixture starts to set before you are ready. Apply mixture to lure with brush while lure is still in rotating vise. Use gentle heat from hair dryer to thin and flatten epoxy on lure while using brush to remove excess. Rotisserie spins about 6rpm which is perfect for drying and curing epoxy top coat. Clean brush with denatured alcohol so you can use again. I only float the river January 1st and March 17th, St Patricks Day. Try to stay dry both times. It is god awful dirty later in the year. We always went Fathers Day weekend years back but the frat boys and the white trash / meth heads ran us off. It is a great float off season.